» Beauty Creams - blessing or curse? WOMAG is conducting an online survey. If you like the idea and concept of WOMAG, please support by taking this short survey. Subscribe WOMAG - It's Free! Subscribe to WOMAG by filling up a simple form, and get every issue of WOMAG deliverd to your inbox! 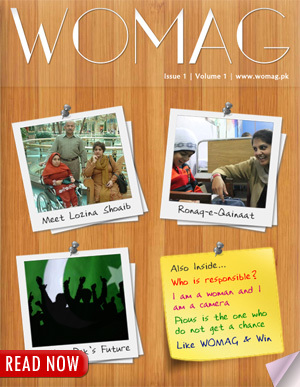 © Copyright 2013 WOMAG.pk - All rights reserved. This material may not be published, rewritten, or redistributed without permission.